As body armor improves and as the presence of lightly armored vehicles increases on the battlefield, it is reasonable to expect that inexpensive steel cored armor piercing rounds will become more desirable. Currently, there are 5 steel cored armor piercing loads widely available, in all calibers: .30-06 M2, 7.62x51 M61, 7.62x54R BP, 5.45x39 7N22, and 5.8x42 DBP-10. Because the M2 and M61 cores have such uncompetitive L/D ratios, we will forgo scaling those projectiles down, and instead focus on analogues to the 7N22 and DBP-10. Scaling the 7N22 projectile to .224" caliber, we get a weight of 59.9 grs and a length of 1.020". Doing the same for the DBP-10, we get a weight of 60.7 grs and a length of 1.015. So far, both bullets seem very comparable, with the 7N22 projectile having a somewhat higher ballistic coefficient. 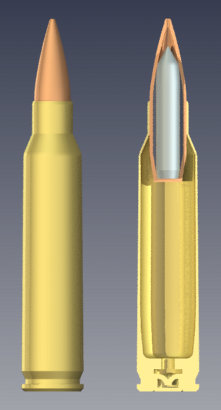 Bullet seating will be calculated both for the intended depth of the original 7N22 ammunition, and to fit within 5.56mm's OAL, respectively. The former produces a figure of 2.488" overall length. The 5.8mm caliber has two versions: one intended for rifles, and one intended for DMRs and machine guns. The former has an overall length of 58mm, while the latter has an overall length of 61mm. The case length is 42mm, giving the each bullet 16mm and 19mm of exposure, respectively. We will use these figures, adjusted for caliber to 15.19mm (.598") and 18.03mm (.710"), as well as the original figure for 5.56mm of 12.70mm (.500") to give us overall lengths for each. As we can see, performance is very similar for all types. The ideal configuration might be found in an adapted DBP-10 projectile - perhaps with a proportionally larger core - designed to fit within the existing 2.26" OAL of 5.56mm. This would give comparable performance to the DBP-10 within 500m, and cause minimal logistical disruption. The projectile could have reverse-drawn jacket with closed tip giving it a good ballistic coefficient and excellent accuracy, while conforming to international treaties. The finished product might look something like the render in figure 6. Doesn't the US military have the armor-piercing 5.56mm M995 cartridge out there somewhere? M995 is tungsten-cored. I have done the math on this, and I do not think switching to tungsten-cored projectiles wholesale as a counter to improving body armor is sustainable in the long-term. Armor piercing requires either an increase in velocity to punch through, or an increase in toughness to punch through. The KTW series of handgun bullets increased toughness. In rifle technology velocity maximums have pretty much been defined, so toughness increases seem to be the way the industry is going. Energy=0.5MxVSquared. Increasing mass is less of a winner (linear increase) in projectile energy than increasing velocity (exponential increase). For cannons, tungsten makes a lot of sense as it is very dense (same as gold) and very tough. 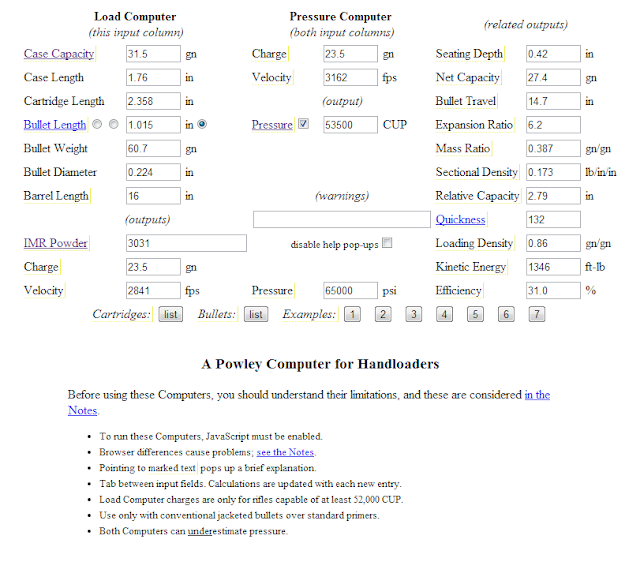 Since cannons are already max velocity with the technology available adding mass and toughness is a winner. For small arms there isn't much of a way to make use of that density and toughness over steel and copper which are cheaper and designed for soft targets instead of armored vehicles. Save the tungsten for anti material/anti vehicular platforms. Steel and copper (and lead) are fine for small arms. That was essentially my conclusion also.